A fascinating exchange of best practice between the UK’s tax authority, Her Majesty’s Revenue and Customs (HMRC), and the Polish Ministry of Finance, centred around the way in which tax offices communicate with tax payers, and the role of digital technologies in making taxpaying simpler. The ease, predictability and transparency of paying taxes is as important to global investors as the actual tax rate. The World Bank’s latest Doing Business report for 2019 says that in the UK, a typical medium-sized firm (60 staff) will spend 105 hours a year filing VAT, CIT and payroll taxes (the fourth-lowest in the EU); in Poland, the same sized firm will spend more than three time as long – 335 hours. Of all EU economies, only in Bulgaria (427 hours) is the administrative burden higher. How is Poland doing in terms of making its tax system more user-friendly? Poland has recently undergone a major shake-up of its tax system, introducing Single Audit File – Tax (SAF-T) for all VAT payments, as well as introducing voluntary split payment of VAT for B2B transactions. Real-time reporting of fiscal cash registers will be introduced this year for some sectors where cash-in-hand transactions often go unreported and untaxed. This is all leading to extra work for business owners. The intention of the conference, which attracted a full-house with many CFOs and finance directors – and Polish tax-office directors too – was to show how HMRC has changed the way it treats taxpayers (they are now called customers) through the introduction of clearer communication and digital solutions. Richard Hawthorn, deputy director of Customer Communication Services, at HMRC explained how the UK tax system has evolved over the past 20 years, focusing on the significance of predictability and transparency. Starting by setting out HMRC’s mission and strategic objectives, Mr Hawthorn provided cost-benefit case studies of how the amount of tax collected increased when the communication improved. One example that appealed to the Polish audience was the bespoke breakdown of how an individual taxpayer’s taxes were spent by the UK government. 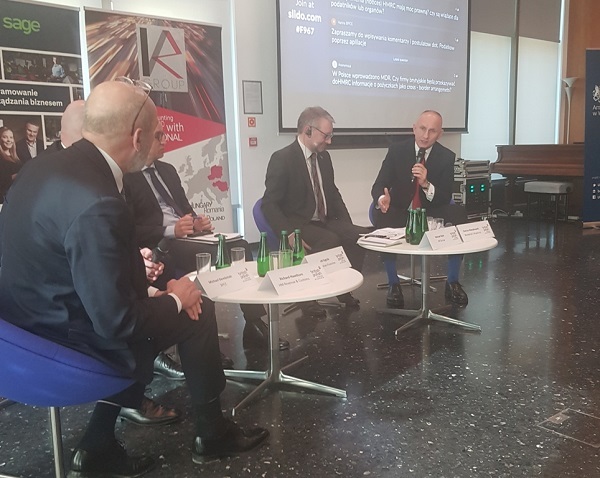 Mr Hawthorn joined the first panel, moderated by Michael Dembinski, the BPCC’s chief advisor, along with Michał Zdyb, head of tax at KR Group, Dariusz Wasylkowski, tax partner at Wardyński & Partners law firm, and Dr Leszek Syguła, director of the Analysis Department at the Ministry of Finance. Dr Syguła impressed participants with his overview of the current reforms being introduced into the Polish tax system. One huge simplification for individual (pay-as-you-earn) tax payers in Poland is the ability to confirm simple tax returns (where there is one employer and no change in status in the tax year) with just two clicks. The new system had half a million visits in the first 48 hours of operation (out of 22 million taxpayers to whom it is relevant). There was a general consensus among the audience that tax paying in Poland is getting easier, although there are still problem areas. Mr Zdyb highlighted this issue by mentioning a client who had received a tax judgment stretching to 230 pages. The key to clarity, he said, was cutting out all unnecessary verbiage from tax communications. Mr Wasylkowski spoke about the importance of tax mediation and alternative dispute resolution, which can help tax offices and tax payers reach a settlement far quicker (and cheaper) than going through tax courts. This is a solution that works well in the UK. Dr Syguła also perceived it as something that could bring improvements and ease the backlog of tax cases in the courts. Talking about the communication between the tax payers and tax offices, the speakers also acknowledged that the responsibility for the length of the letters and complexity of argumentation is shared – the longer the letter from the tax office, the more extensive the response from the tax lawyers and accountants representing the taxpayer. The panellists discussed the lack of trust between taxpayers and the tax offices as well – very often the first question arising after receiving correspondence from the tax office is whether the content needs to be checked against the real state of the matter or the tax law. But as Michał Zdyb underlined the spirit of cooperation is crucial. We should not think of the tax system as a normal part of business activity. It could be a valuable source of information for the businesspeople on the reliability of their business partners. Being able to access statistics on how the tax revenue is being spent – a usual practice by HMRC – would also have a potential to change the tax payers’ perception of the tax collection. The second presentation, by James Low, HMRC’s content design lead, looked at the UK government’s journey to provide all government services via one website (gov.uk), regardless of which department or agency provides it. Work started in 2004 with the Directgov website for citizens and the BusinessLink website for business; the two were amalgamated over time and unified on the gov.uk site together with all other government department sites by 2014. GOV.UK and all new UK government services created since 2013 are designed to ensure mobile access to government services via smartphone, tablet, laptop and desktop devices – making them as accessible as possible to UK citizens and businesses. 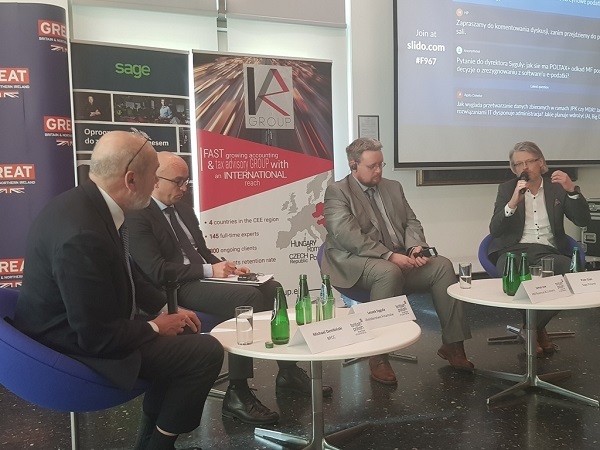 The second panel consisted of James Low, Dr Syguła representing the Polish finance ministry, and Piotr Ciski, country manager of Sage Poland, a leading supplier of accountancy software to Polish SMEs. 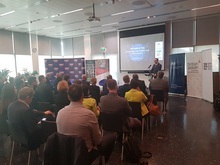 Mr Ciski explained how his firm has an important – and unpaid – role in educating the small Polish taxpayer in the changes being introduced into the tax system, and the important work carried out by tax agents to whom entrepreneurs often outsource filing their tax returns. Dr Syguła fleshed out the Polish government’s approach to further digitisation of taxes and cooperation between ministries, coordinated by the Ministry of Digital Affairs, towards creating a gov.pl portal. The panellists talked about the challenges that digitalisation brings as well – the enormous volumes of data collected that has to be processed, and the threat of digital exclusion that some people or companies can face. Mr Ciski underlined that with the growing number of digital solutions in the tax field, more and more SMEs that hire external accountants to take care of their taxes, but the role of those external providers grows and changes as well – from pure bookkeeping to more sophisticated finance. James Low admitted also in the UK there is a group of taxpayers that struggle with the digital transformation and it’s important to adjust the means of communication to all groups among tax payers. The underlying rule of the HMRC is Getting tax right, for everyone. As Mr Hawthorn said at the very beginning, the design of the tax system is always a trade-off between simplicity and fairness. In seeking to obtain the optimal balance between the two, communication is key. The BPCC and its members value the best practice from the UK, provided to us by the HMRC guests. Thanks to the tax expertise of the content partners of the project – KR Group, Sage and Wardyński & Partners, the BPCC will be able to present some UK best practice recommendations for the Future of Tax. Tax and finance – important for manufacturers too! The BPCC’s Manufacturing Industries group met in Rzeszów at McBraida factory on 12 March 2019, for a meeting aimed at CFOs and finance directors of manufacturers. The aim was to look at tax and finance issues facing manufacturers in Poland. 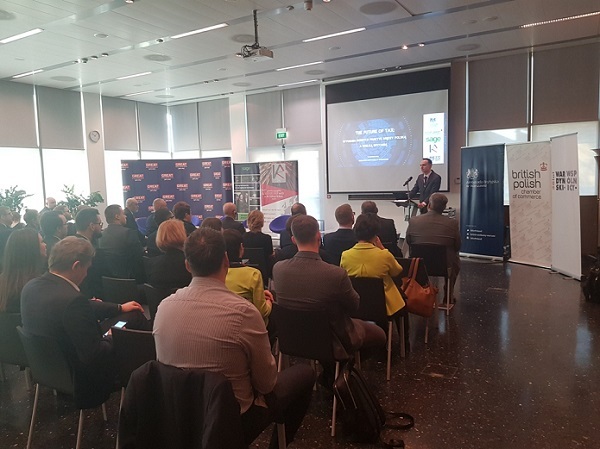 BPCC members from the construction and real estate sectors got together with their opposite numbers from the Scandinavian Polish Chamber of Commerce to discuss prospects for Poland’s built environment in the short- and medium term. With a month to go until the UK is scheduled to leave the EU, the uncertainty regarding the terms of the departure is causing great concern to Polish exporters. According to the current arrangements on March 29, 2019 UK will leave the European Union.